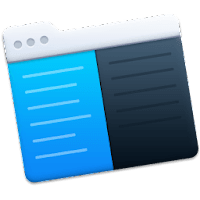 Commander One is a free dual panel file manager for Mac OS X written entirely in Swift, that grant you absolute control over your files and folders, It's fast and powerful yet simple and easy to use - which save you thousands of hours. Commander One is packed full with most important features for perfect Mac file management. No matter if you are a professional user or just finding your way to becoming a pro in fully controlling your documents — Commander One is your all-in-one solution. Commander One features Dual panel interface combines an FTP client for Mac and an Amazon S3 browser and provides you with the built-in Mac Terminal emulator making it super easy for you to manage all the system processes. It lets you open an unlimited number of tabs, supports any file types, offers the ability to set up your very own hotkeys for any action, and way more. Commander One is feature-rich application that offers many essential functions such as built-in FTP/SFTP and WebDAV clients, easy moving and copying files from one place to another by it's dual-pane interface, multi-tab browsing for eliminating clutter, advanced search for locating files quickly, file operations queueing, hotkeys setup, ZIP support and much more. Commander One's fast and simple Mac archiver, supports multiple types of files. You can work with your ZIP, RAR, TBZ, TGZ, 7z files. We are working on adding the possibility to compress to RAR at this time. Furthermore, with a built-in FTP manager you can easily connect to remote servers through FTP, SFTP or FTPS. With two panels instead of just one, the program promotes efficiency and speed and also neatly organizes your file operations in queue. Improved: functioning when the user's directory was moved. Disclaimer: Direct downloads for the lastest version of Commander One 1.7.3.2381 for Mac are provided by the official software's author, we can't guarantee safety, availability or download speed. Moreover, we don't and we won't provide any pirated/illegal versions or tools. We recommend you to avoid it as these methods can harm your device. If you like the software, buy it to support the developers. (We provide software discounts for many worldwide brands).